Each year many people are injured or killed on a construction site. They suffer lost wages and significant medical bills as well. Construction injuries often can have serious and permanent sequalae due to the failure of the construction companies to properly inspect the accident sites. All contractors involved in a construction job must ensure that the scope of their work is safe from defects and must warn others of hazards created by their work. 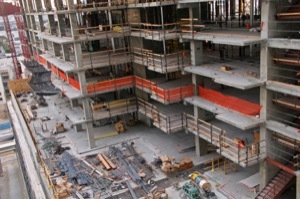 Construction sites are often dangerous places where people are injured every day. Some common construction injuries that can occur include falls from heights, scaffolding accidents, trip and fall, falling objects, collapsing structures, explosions, cave in accidents, faulty roof construction, electrical wiring problems and other catastrophic accidents. Very often construction site injuries have both a workers compensation component and a third party liability component to them. It is often better to complete the workers compensation claim before filing a lawsuit for personal injuries. However, not all workplace injuries are workers compensation cases. There could be an invitee on a job site who has nothing to do with the construction work being performed. Regardless, the cases all revolve around general principles of negligence. Similarly, the damage aspects of these type of cases follow the general rules for damages in all personal injurie cases. Because some of the accidents involve equipment or machines, one may need to engage an expert witness such as an architect, and engineer or a construction foreman. There is a standard of care in the construction community that all construction companies must follow in addition to normal and customary general principles of negligence. A construction company cannot do something that a normal construction company would do or fail to do something that a normal construction company would do; otherwise they would be deemed negligent. In order to establish what that standard in the industry is, the expert would offer opinions for the jury to consider. Depending upon the severity of the injuries, one might also need to engage the services of an economist to determine the future loss of earnings by actuary tables and reduce it to present value. Because the numbers become significant, the settlements may involve structured payments over a period of years. If health insurance or workers compensation insurance pays any of the medical bills, there may well be a requirement to reimburse the payer for all sums they paid on the workers behalf. There may be deductions permitted for contribution to attorney fees but that is usually handled on a case by case basis. If the injuries result in the death of the worker, it can cause an entirely different set of circumstances. One then needs to determine by statute who the possible beneficiaries are for the claim and proceed accordingly. These type of cases are very complicated so an experienced lawyer is always best to have on your side. If you or a loved one has been injured as a result of a construction site accident, call the accident attorneys from Foran & Foran, P.A. and we will be happy to assist you.